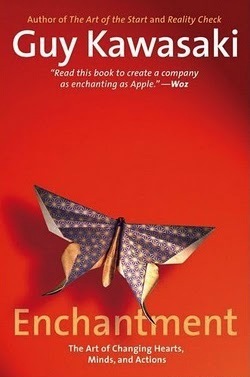 If you missed it, Guy Kawasaki has released a new book ‘Enchantment‘. If you didn’t miss it then your where we are, being enlightened to sending a positive brand image to our customers. A few of us got advance copies and those that didn’t plunked down their cash as soon as it was publicly available. While the reason for this post isn’t about reviewing the book, we can say that Enchantment steps away from Guy’s past books a bit and takes us on a fast paced journey to changing the world. Each in our own way, whether that is with customers, co-workers and even our bosses. It stresses that being trustworthy builds the lines to our doors as people become the faithful because we care. The actual reason for this post is around the need to notate so many ideas and paths forward in Guy’s books that we normally end up with some sad looking books on our shelves. Day one of Enchantment’s release, it is available on the Kindle. Like other print vs Kindle versions, the eBook is slightly cheaper. Of course, you can’t pass a Kindle eBook around from one iPad to another but for these we are interested in keeping our notes personalized to ourselves so we wouldn’t be passing the print version either. The Kindle reader, which we have covered before comparing to the Apple iBooks, offers the feature of reading your eBook across your iPad, iPhone, Mac and PC. This is important for research/education books… and Guy’s books, since both need have particular areas referenced later. 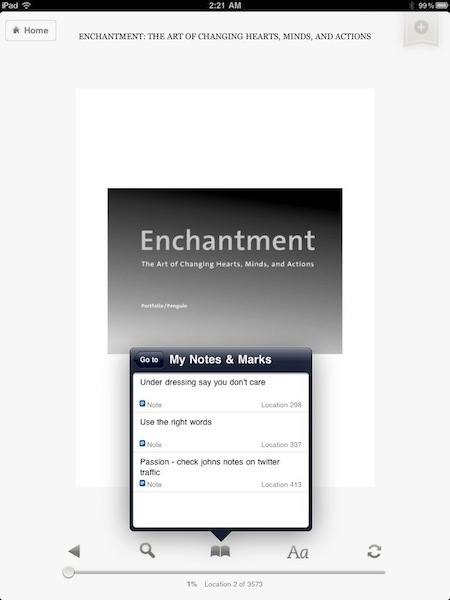 While reading Enchantment on the iPad through the Kindle app, we are able to highlight sections of text and make notes on areas of the books for later reference. Doing both is as simple as holding your finger on text within the eBook. 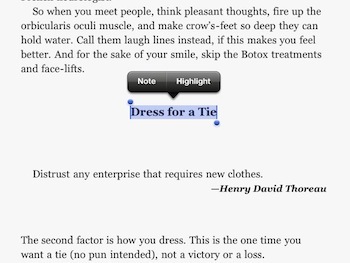 This will get you the option to Highlight or add a Note. 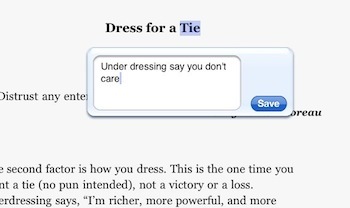 Before choosing either, drag the corners of the blue window to cover the text your wishing to reference later. Choose ‘Hightlight’ if wish to add a yellow highlight to the text. If you choose the ‘Note’ option, you will be given a small text box to type your note related to that area of the book in. Why the highlighting and ‘notes’ is so important to us for Enchantment is because the information in books like these come at you really fast. They do you little good to read through and sit them on the shelf. They are to be used over and over again to get ideas when working with a particular type of customer, when needing to remember the steps and most important to get the energy up prior to presentations. With a print book, this has ment jumping from one sticky book mark to another to find the item you needed to reference. In the case of the Kindle version of the book, from anywhere in the book it is possible to pop up the list of noted areas and jump right to them.